HAS YOUR DÉCOLLETAGE LOST IT’S LUSTER? Overtime, you may start to notice a change in your skins appearance, typically in form of fine lines and wrinkles. 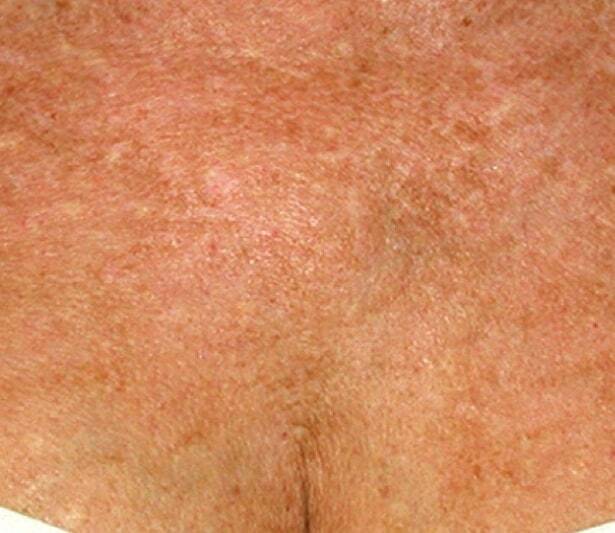 You may also start to notice brown spots or hyperpigmentation. These changes are accelerated on exposed areas like the hands and décolletage. These changes are commonly caused by genetics and aging. But environmental factors such UV light, smoking, pollutions, poor nutrition, or excessive alcohol use may also play a role. The décolletage is a prominent and exposed region on a woman’s body. It receives extensive environmental exposure resulting in severe sun damage and rough skin texture. If you are self-conscious and avoid wearing low-cut dresses; it's time for décolletage rejuvenation. Erase the imperfections with the new laser technology offered at Cleveland Cosmetic Surgery. Fortunately, there are several new techniques proven to rejuvenate and restore your décolletages appearance. Learn more below. 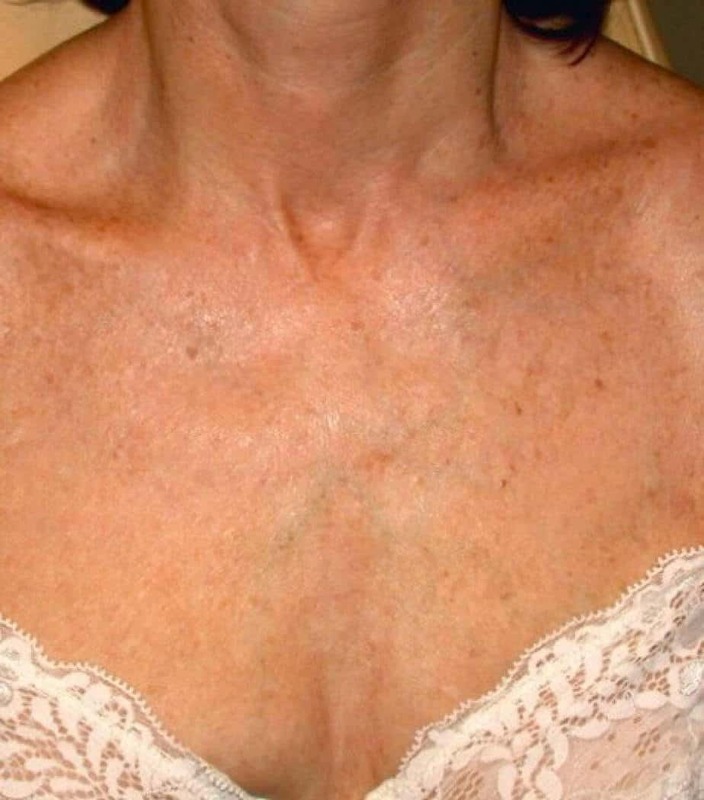 Until recently this was a very difficult region of the body to rejuvenate.The décolletage area is very prominent and often receives the most environmental exposure resulting in severe photo damage. Unhealthy skin changes are often seen as brown spots, spider veins, age spots and rough texture. Many patients are self conscious and avoid wearing low cut dresses. The new Harmony 360® and Pixel Perfect® lasers have revolutionized the way Dr. Diamantis rejuvenates this area. The new generation of lasers will reverse years of photo damage and rejuvenate the skins elasticity. Dr Diamantis uses a light laser to smooth the texture of your skin by removing the damaged outer layers. Although Light lasers are used mostly on the face, they can also be used to improve the skin on your décolletage, neck and hands. A laser is one of the least invasive ways to improve the appearance of your skin. Sun exposure, acne, or just getting older can leave your skin tone uneven, wrinkled, spotted or scarred. Be sure to ask Dr. Diamantis questions. It's very important to understand all aspects of your Laser Therapy. It's natural to feel some anxiety, whether it's excitement for your anticipated new look or a bit of stress. Don't be shy about discussing these feelings with Dr. Diamantis. Victoria loves the outdoors. So much so that she took up nature photography. While she embraced many parts of getting older, she was not a fan with the changes she started seeing in her skin especially the decolletage (chest area). She sought out treatment with Dr. Diamantis, and now Victoria is thrilled with what she sees. She can't wait to rejuvenate her hands with the Harmony 360®. 1. HARMONY 360® - is a revolutionary skin treatment which uses three types of laser light beams to revitalize the skin with virtually no down time. The Harmony 360® effectively reverses years of sun damage, brown spots, red spots (spider veins) and acne. Absolutely no down time. Victoria loves the outdoors. So much so that she took up nature photography. While she embraced many parts of getting older, she was not a fan with the changes she started seeing in her skin, more specifically the decolletage area. She avoids wearing low cut dresses because Victoria is self-conscious about her chest area. She sought out treatment with Dr. Diamantis, and now Victoria is thrilled with the results. Next planned treatment is her hands. "Snowbirds winters in Florida with her husband, retired school teacher"
"I will wear that new dress with confidence." Marylin is a free spirit who enjoys the "chirping of birds" and long walks on the beach. 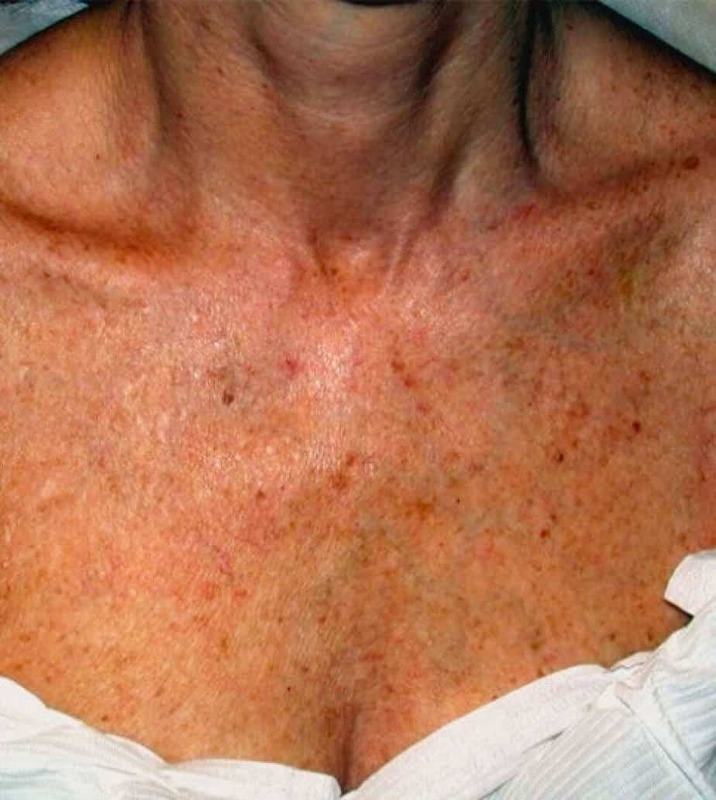 Years of environmental exposure have done a number on her skin especially her chest and shoulders. With a grandchild's marriage on the horizon, she wants to wear a stylish dress for her only granddaughter's wedding. She decided to seek out help, and she's thrilled she did. Marylin bought that sleeveless dress and is wearing it with confidence. 1. PIXEL PERFECT®– A new skin treatment which utilizes CO2 technology to revitalize the décolletage and shoulders. The Pixel Perfect® effectively reverses years of photo damage, brown and red spots, and wrinkles.